A New Beautiful Darkness Cover? I absolutely love this cover. It caught my attention immediately; it's not often you see a bright, hot pink cover. And the phone dangling on the side? That just piqued my interest even more. I soon read a review by Maggie Stiefvater on the book and I finally got my hands on it. My favorite part about the cover is not actually the cover itself. It's how the cover makes its way inside the book. The monthly dividers inside the book are on HOT pink paper. It looks awesome! And a few pages in the beginning and one in the end are black. They look so cool! It's not a typical thing in books and it is way awesome! The phone also relates to the book. Which is cool. Amazing. 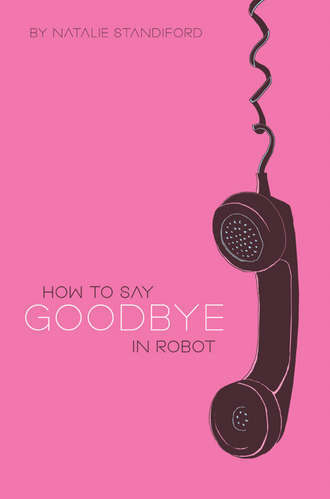 How to Say Goodbye in Robot is about a girl, Bea, who is forced into a new school where she meets outcast Jonah, or Ghost Boy. Jonah hasn't had friends in a really long time and he lets her into his world very easily and Bea becomes closer to him than she has ever been to another person. Even family. I have never read a book like this before. It is utterly original and completely touching. I became addicted to this book from the first page and when I wasn't reading it, I was thinking about Ghost Boy and Robot Girl. Wondering where they would go and how the book would end. It was fantastic. I highly recommend this to everyone, especially someone looking for a different, honest, unpredictable story about realistic teenagers. I love love love love loved this book. I stayed up all night when I got it, and finished it that night. It was really great! I can't wait to read her new(ish) book. Confessions of the Sullivan Sisters. It sounds really great.